Something different for today - taken back in November when I was on Whitby Island with Lee. We drove by this lost car and had to stop for a couple of shots. Some things changed here in the last couple of days. Most of these changes are really small but maybe some of you realised that some bugs could be solved :) and after thinking about my contact page for a while I can proudly present the new version - so go and have a look: I am waiting for feedback! Right now I keep being not that communicative and so there are still a lot of emails I should reply to. In case you are waiting for one: please be patient with me. Mal etwas anderes für heute. Aufgenommen Anfang November letzten Jahres, als ich mit Lee auf Whitby Island war. Wir fuhren an diesem doch recht einsamen Auto vorbei und konnten es nicht sein lassen, dort anzuhalten und ein paar Bilder zu machen. In den letzten Tagen sind hier einige Veränderungen passiert. Die meisten sind recht klein und fallen vielleicht nur wenigen auf. Aber es gibt auch eine größere: nachdem ich Ewigkeiten über meine Kontaktseite nachgedacht habe, gibt es nun eine neue Version. Also schau sie Dir an und sag mir, was Du davon hälst (eine deutsche Version soll es irgendwann auch noch geben). Derzeit bin ich nicht so wirklich kommunikativ und so stappeln sich noch immer unbeantwortete Mails in meinem Postfach - solltest Du auf eine Mail von mir warten, so habe Geduld. schön verrottet, der kahn! hat zu lebzeiten bestimmt einen heidenspass gemacht! always like shots of old rusty cars... diggin this. I can see why you stopped to photograph this old car. i lve the colours in this and your low point of view. 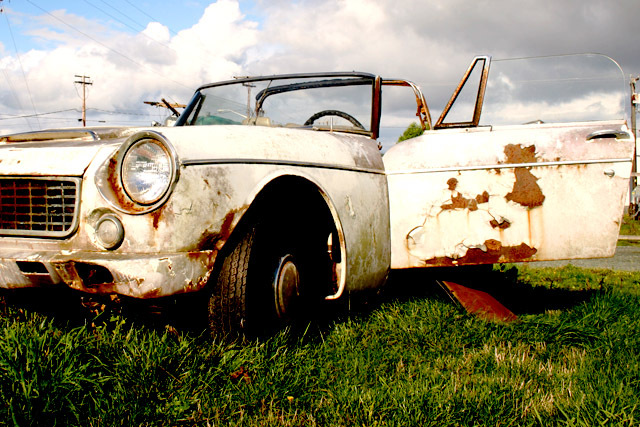 I'm definitely with Fais on this - love rusting pieces of beauty like this - well shot. Please tell me you got a shot of the dash too. Like the new About page btw. Hey glad you stopped to shoot these pics. What a shame this nice car was left to fall apart like this. Schade um's schöne Auto, aber verrostet sieht's aus gut aus! :) Schön gesehen! Extrem schicke Schüssel. Das anhalten hat sich gelohnt. Eigentlich schade, daß das gute Stück so verrottet ist. Nice find. What a great piece of Americana.